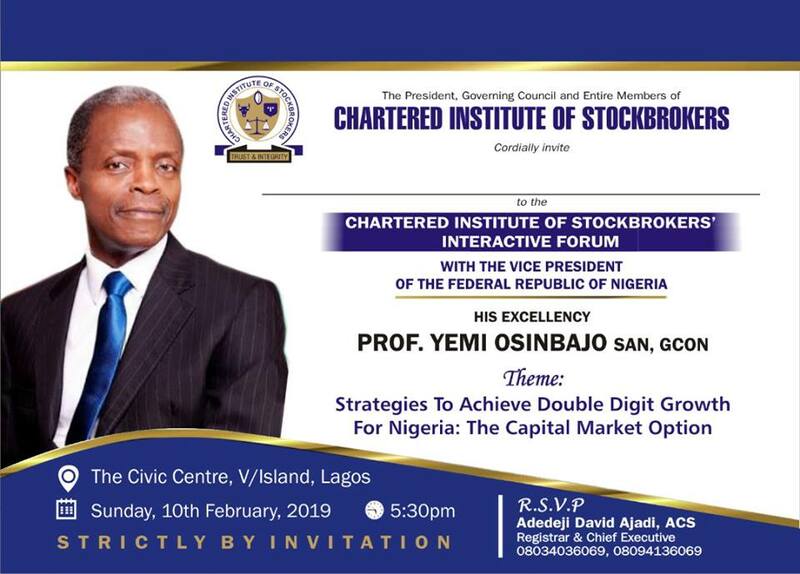 A meeting between Vice President Yemi Osinbajo and the Chartered Institute of Stockbrokers is scheduled for Sunday, February 10, 2019. The theme of the session is Strategies to Achieve Double Digit Growth for Nigeria: The Capital Market Option. During the gathering, the stockbrokers will use the occasion to discuss how government can tap into the capital market to boost the economy. Mr Osinbajo heads the federal government’s economic team and he will be hoping to get valuable suggestions from the stockbrokers. Chartered Institute of Stockbrokers is the only professional body in Nigeria authorised to carry out qualifying examinations into stock broking profession and control the activities of the members and matters associated with it. It was established to majorly support and defend the interests of the securities and investment profession by maintaining the highest principles of service and integrity.